Its an ongoing question. Time Magazine has a new article out today suggesting we made war. It is one of the world's oldest cold cases. Sometime between 50,000 and 75,000 years ago, a Neanderthal male known to scientists as Shanidar 3 received a wound to his torso, limped back to his cave in what is now Iraq and died several weeks later. New research suggests that Shanidar 3 may have had a more familiar killer: a human being. 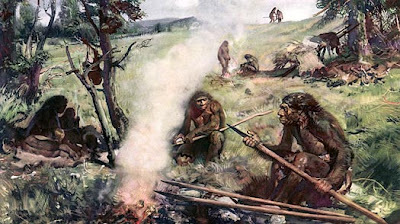 At the time of his death, only humans, who had adapted their hunting techniques to the open plains of Africa, had developed projectile weapons; Neanderthals, who hunted in the close quarters of forests, used thrusting spears. To learn the cause of Shanidar 3's wound, Churchill and his team used a specially designed crossbow to fire stone-age projectiles at precise velocities at pig carcasses (a pig's skin and ribs are believed to be roughly as tough as a Neanderthal's). At kinetic energies consistent with a thrown spear, the pig's rib bore damage resembling Shanidar 3's isolated rib puncture. What's more, Churchill found that the weapon that killed Shanidar 3 entered at about a 45-degree downward angle. Churchill also found that Shanidar 3's rib had started healing before he died. By comparing the wound with wounds documented in medical records from the American Civil War, a time before antibiotics, Churchill hypothesized that Shanidar 3 probably died within a few weeks of the injury. Others suggest they may have interbred with humans. Read the competing interbreading theory here. I'm not an Anthropologist, so I feel confident I can answer the question posed in the headline: Yes. There is a relevant line of lyrics by Sublime which comes to mind(though I cannot seem to recall the first word in the line, perhaps due to the admonition directly above this comment box): "**** and fightin', it's all the same..."